Georgia Ruth is a Welsh singer-songwriter/multi instrumentalist who as well as recording her own music, presents a weekly radio show on BBC Cymru. 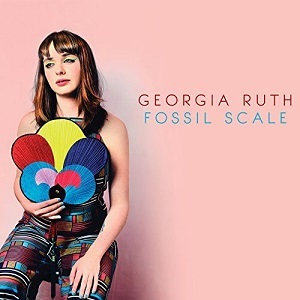 In 2013 Georgia Ruth's album "Week of Pines" won a Welsh Music Prize - quite a feat for a debut album. Now she's back with her new album "Fossil scale". For this album, she switched from using the harp for writing and used the piano instead. Written in Caernarfon, the album was recorded at studios in Wales and London, necessitated by the sale of the first studio she started to record in. As with her first album, this album features both English and Welsh languages. While Welsh vocals may mean that only a small number of people understand the lyrics, you don't need to understand the lyrics to enjoy listening to the songs as you can still appreciate the music and her beautiful voice. While Georgia Ruth my be described as a folk artist, there's more to the music than that simple description would suggest. At times there's a Kate Bush influence, and maybe a hunt of Bjork. The're an interesting element added by use of the Sarangi, which works really well in the songs but I do think it's underused and could have really lifted the album up a level if it had been used a bit more. A very good album that will appeal to folk lovers, fans of Welsh music and anyone who loves soft music and lovely vocals. "Fossil Scale" is out now on Navigator records.